If you are tired of spending time in the mirror battling frizzy, unruly hair each day, only to have it frizz again when you walk out the door.. well then a keratin treatment is the answer. A keratin treatment is actually a long lasting conditioning treatment which transforms your head of hair into the beautiful silky smooth hair of your dreams and it stays that way for up to 5 months. Express lasts up to 6 weeks. Complex lasts up to 5 months. Express requires an 8 hours waiting period to wash hair, pull it back or be clipped up. Complex requires 72 hours. A: THE KERATIN COMPLEX AND KERATIN EXPRESS TREATMENTS work by infusing a special blend of patent pending natural keratin deep into the hair cuticle. The keratin is bonded into the cuticle by the heat of the flat iron to relax the hair’s sub-cuticle layer. The effect is that frizz is instantly eliminated and unwanted curl is dramatically reduced. Your hair will be more manageable and smoother than before with amazing shine and silkiness. A: Time should be determined on an individual basis depending on your hair length, type and texture. COMPLEX- A: Please allow a 2 to 3 hour window. EXPRESS- A: Please allow 1 hour window. A: With either treatment your hair will be more manageable, more resistant to humidity and take much less time to style straight. It will be noticeably softer and smoother with added life and shine as well as a lengthened look. Q: I like to wear my hair curly sometimes, but don't like the frizz. Will this treatment work for me? A: Yes, frizz is eliminated and curl is reduced. So if your hair was curly (not just frizzy) to start with, you may style your hair straight one day and the next day diffuse dry it to enhance the wave or curl. If the hair shaft is more saturated with the keratin, the outcome will result in straighter hair in the beginning and your curl pattern will slowly but gradually increase with each shampoo. Discuss the results you want to achieve and the stylist can explain the process which includes the amount of the keratin needed to get those results. Particularly frizzy areas are normally treated more heavily and the amount of keratin applied can be tailored to meet your needs. Q: What about cost? Why did the stylist quote a higher price for me than my friend paid for her service? Price is set by the amount of time it takes to perform the service, however if you have longer or denser hair or a higher amount of frizz your hair may require more keratin than average. An experienced stylist can determine the amount of keratin needed and if additional keratin is needed (it is measured by ounces) and charged accordingly. 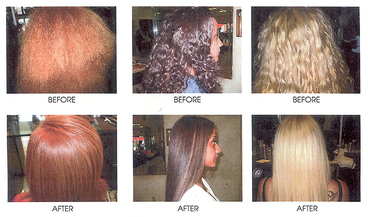 When salons advertise a price for a Keratin Treatment it is based on an average suitable for most hair. COMPLEX- A: You must wait 3 days (72 hours) before washing your hair or swimming. EXPRESS- A: You only have to wait 8 hours before washing your hair or swimming. Q: Can the hair be pulled back or clipped up during the waiting period? Q: What should be done if the hair gets wet during the waiting period? Q: Will using the recommended shampoo and conditioner extend the life my treatment? What kind of shampoo and conditioner should be used? A: Yes. The treatment will last the maximum amount of time and it is highly recommended to use the Keratin Care Shampoo & Conditioner (Sodium-Chloride Free) or Keratin Color Care Shampoo & Conditioner (Sodium-Chloride and Sulfate Free). We have clients who find these products reduce frizz greatly and reduce styling time, long after their salon treatments have worn off. They work by infusing a small amount of natural keratin into the hair shaft and are specially formulated to not strip the keratin from the hair. If you use harsh shampoos with phosphates, we cannot guarantee the results. Q: How often can the treatment be done? And how long does it last? COMPLEX- A: The treatment can be done as often as every 4-6 weeks. However, the treatment lasts 3-5 months, depending on lifestyle and maintenance, provided the client follows all after care instructions. EXPRESS- A: The treatment can be done as often as every 4-6 weeks. The treatment lasts up to 6 weeks, depending on lifestyle and maintenance, provided the client follows all after care instructions.